paddle, originally uploaded by DragonDrop. Had a great weekend. Outside for nearly all of it which was good due to the clement weather. 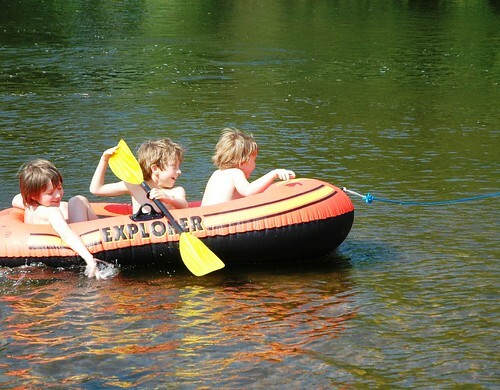 Saturday we went to a patch of river near Ripon with some friends and swam and played and generally messed about. Bliss. After that we went up to Fraser’s shed for a full moon party. A full PA / drum kit / bass / guitar / record decks / my congas / projectors and lasers were set up. Some friends played a set from their band, then a couple of DJ’s took the reigns and I joined in on the congas. Went for a big walk the following morning, saw a giant hogweed (very scary plant) and a massive hare and a buzzard (I think – huge bird of prey, either that or a red kite). From there we went to a friends garden party then home for a bath. By jimmeny, we all slept well.